Do you find yourself struggling to focus on a text? Are you forced to stretch your hands beyond their limit since all writings become a blur with nearness? It’s time you bought a pair of reading glasses. With time, human eyes start progressive degeneration. This condition is known as presbyopia. While this literally means Old Vision in Greek, this state can be experienced by anyone and at any age. Luckily, its adverse effects can be easily thwarted by a pair of readers. Reading glasses work by compensating your hardened lenses. While it’s always sensible to visit an optometrist or ophthalmologist for a checkup, several over-the-counter reading glasses should help you out. What should you know before buying a pair of reading glasses? Readers come in different magnification strengths ranging from 1.0X to 4.0X. The appropriate strength for you depends on how degenerated your lenses are. At times, each of your eyes may require different power. Wrong magnification may cause eye strains which may result in a headache. It’s, therefore, a good idea to visit a physician for a prescription. The glasses should also have a flexible and comfortable temple and arms. Whether metallic or plastic, no one wants a pair that digs into their skin. On this note too, do know that most OTC glasses come in a one-size-fits-all design. As such, frames with sure flex are more likely to be ideal for different face sizes and shapes. If you only need correction for a single field of vision, single-vision lenses are the way to go. The same optical focal point is used for the entire lens. 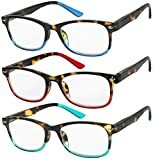 Reading glass lenses usually correct distance vision, but they can also be used to help you see better at an “intermediate” distance (such as the distance between your eyes and your computer screen) and up close. You can find lots of ready-made reading glasses over the counter, no prescription required. 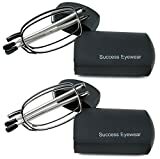 Bifocal lenses usually have an optical focal point for reading on the bottom portion of the lens and an optical focal point for distance vision on the top part of the lens. It’s not common to find bifocal reading glasses over-the-counter. You’ll likely need a prescription if your vision requires bifocal help. Trifocal lenses usually have three different optical focal points: one for distance, one for intermediate distance, and one for near vision. Like bifocals, this type of lens is available primarily through a prescription. Progressive lenses transition from distance-vision to close-up vision without any clear line dividing the sections on the lens. They can be very effective for correcting intermediate vision, but they must be custom-made. You cannot purchase over-the-counter progressive lenses. The strength of the lenses in a pair of reading glasses is measured in diopters and usually increases by 0.25 diopters for each different strength. Reading glasses typically feature either plastic or metal frames. You’ll find reading glasses with lenses made of several different materials. 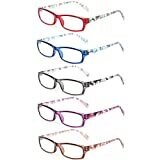 Reading glasses with polycarbonate lenses are resistant to breaking and have a comfortable, lightweight feel. However, they can sometimes distort images. Reading glasses with Trivex lenses are also lightweight and resistant to breakage, but they aren’t as likely to distort images as polycarbonate lenses are. Reading glasses with high-index plastic lenses are ideal if you require a higher strength because they’re thinner and not as heavy, thus making them feel more comfortable on the face. 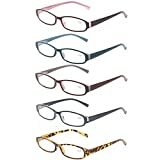 Just like prescription glasses, reading glasses are available in a wide variety of frame styles and colors. Choosing the right frame is really a matter of personal preference, though it often helps to consider your face shape and width when picking out frames. If you have an oval face, look for wide, bold frames that suit your style. 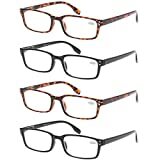 If you have a round face, look for angular frames or a small, square frame style. If you have a heart-shaped face, look for frames that are wide and bottom-heavy. If you have a square face, look for round, wide frames or a semi-rimless style. Some reading glasses feature an anti-scratch coating on the lenses. Because most plastic lenses can scratch easily, it’s a good idea to pay a little extra for this coating. If you plan to wear your reading glasses outdoors regularly, look for a pair with an anti-reflective coating. The coating helps to reduce glare, which can make it difficult to see clearly. You may decide to purchase several pairs of reading glasses. That way, you can keep one at home, one at the office, and one in your car. Some over-the-counter reading glasses are sold in multipacks for this reason. Often, it’s more cost-effective to buy a multipack than it is to purchase several pairs individually. 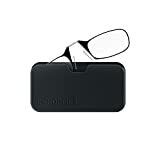 You can find multipacks that include anywhere from two to six pairs of reading glasses. While the strength is the same for all the pairs in a pack, some sets offer frames in a variety of colors and/or patterns.